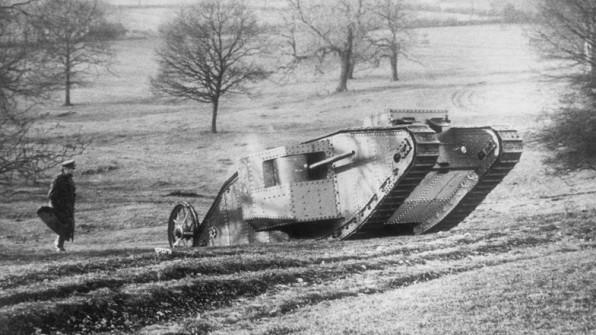 One year to the day after launch of the first mock-up, the Mark 1 tanks were used by the British Army on the First World War front between Albert and Bapaume to the north of Amiens. Although they were not the only ones to work on this new concept of the armoured vehicle, the British were the first to have developed it and try it out on the battlefield. Tests on the "Mother", the prototype of the Mark 1, 1916. Produced in the same workshops as battleships, they were designed as "land-based cavalry". Diamond-shaped with surrounding tracks, they were equipped to shoot at the sides and have a sort of rudder at the back like ships. Eight men formed the crew and the speed was 5 km/h. "For the first time, we have used a new model of heavy armoured vehicle which has done great service", read the British press release which appeared in the newspaper Le Matin. Despite the moderate results, the appearance of these "steel monsters" caused panic in the German trenches and demonstrated the potential of this new 20th-century weapon. Book : Yves Buffeteau, The Infantry Tank, Mark I, II, III, IV, V - 1916-1918, Ysec Editions, 2017.